Grow in moderately fertile, medium moisture, well-drained soil in full sun to part shade. Best in full sun. Prefers rich, moist, organic soils. Also prefers moderate summer temperatures over the heat and humidity of the deep South. Needs good air circulation (space well and thin out stems as needed) to help combat potential powdery mildew problems. Intolerant of drought and needs to be watered in dry spells. Avoid overhead watering however. Appreciates a summer mulch which helps keep the root zone cool. For winter, cut plants to the ground and remove from the garden plus clean up all plant areas in order to minimize possible powdery mildew infection for the following growing season. Remove faded flower panicles to prolong bloom period and to prevent unwanted self-seeding (cultivars generally do not come true from seed). Phlox paniculata, commonly known as garden phlox, is native from New York to Iowa south to Georgia, Mississippi and Arkansas. It has escaped gardens and naturalized into areas beyond its original native range. In Missouri, it is typically found south of the Missouri River in moist or rich low woods, thickets, alluvial banks and gravel bars along streams and bluff bases (Steyermark). This is an upright perennial that grows in a clump to 2-4' tall and to 2-3' wide on stiff stems clad with conspicuously veined, opposite, pointed, elliptic, deep green leaves (to 4-6" long). Fragrant, tubular, pink-purple to white florets (to 3/4” diameter) are densely packed in large, tiered, domed terminal clusters (to 6-8") over a long July to September bloom period. Each individual floret has a long corolla tube and five flat petal-like lobes. Butterflies love the flowers. A large number of garden phlox cultivars in flower colors including white, lavender, pink, rose, red and bi-color are available in commerce. Cultivars resistant to powdery mildew are often the best choices. Specific epithet refers to the plant bearing flowers in panicles. Phlox is not always an easy plant to grow well. Phlox bugs, powdery mildew and root rot can be serious problems. Spider mites can also be a problem, particularly in hot, dry conditions. Taller stems may need staking. 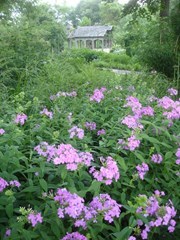 Garden phlox is a staple of the perennial border. Mixes well with other perennials and provides long summer bloom. Regardless of flower color, garden phlox is attractive to hummingbirds and is a good selection for inclusion in a bird garden.